While Jesse was crushing Quad Dipsea, I decided to wait for him by reading at a local coffee shop, and when I had filled my quota of quality Nook time, I’d go on a run. I wanted to run between 8 and 10 miles on the trail. Apart from the oatmeal I ate at 6am before I left the apartment, I hadn’t eaten anything or brought any additional fuel with me. This would become significant during my run. 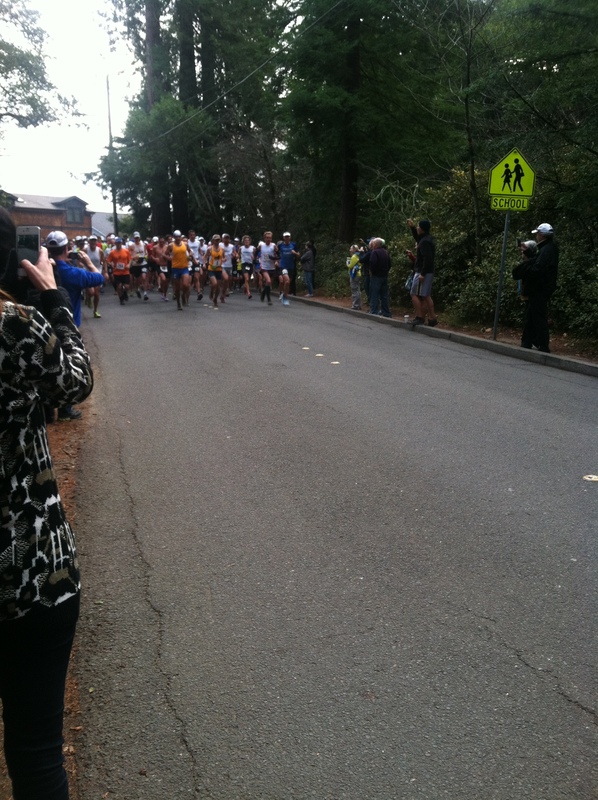 Starting line at Quad Dipsea. 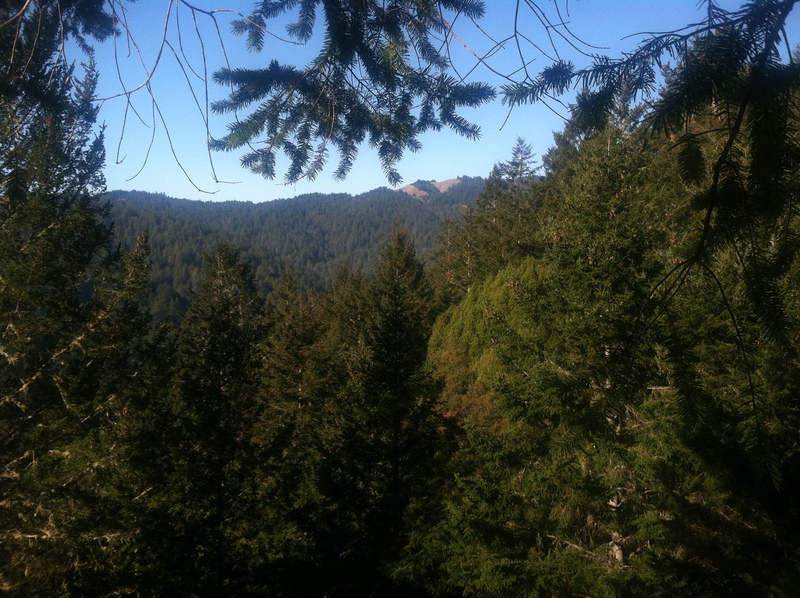 I listened to Jesse’s recommendation and started on the Dipsea Trail, then took the Sun Trail about a mile into my run. I had never ran on the Sun Trail before but soon learned that it was a beautiful, gradual trail with breathtaking views of Marin. View from the Sun Trail. After the Sun Trail, I ended up behind the Tourist Club and subsequently on Ocean View Trail, which dropped me down into Muir Woods, near the bridges and other tourist attractions. 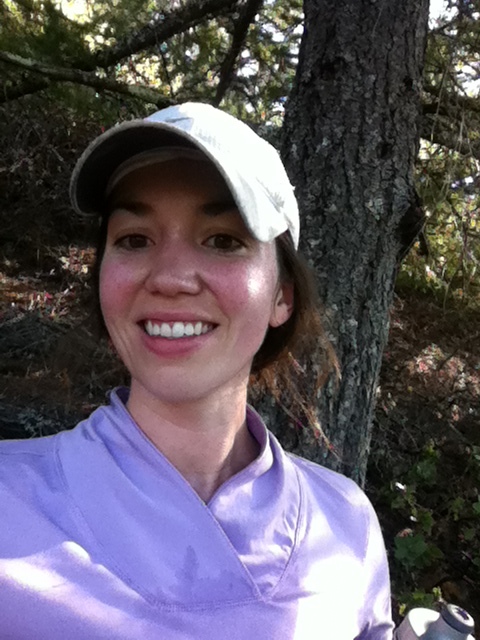 I was about 5 miles into my run and starting to feel the miles and elevation: I needed fuel and had none. After one attempt to return on the trail the way I had entered and finding the Ocean View Trailhead closed, I was confused and a bit disoriented. Normally, I have a keen sense of direction (being a late adapter to technology forces you to rely on resources not named Google Maps), but my low blood sugar coupled with the trail closure had me very confused. I was so desperate I even went into the Muir Woods Visitors Center Cafe to check for sugar packets but found litter-free sugar tumblers instead. I ended up taking the very steep Ben Johnson trail up to the Dipsea and found myself in the midst of the Quad Dipsea (but no Jesse in sight – I had figured correctly that he was closer to Stinson Beach at the time). 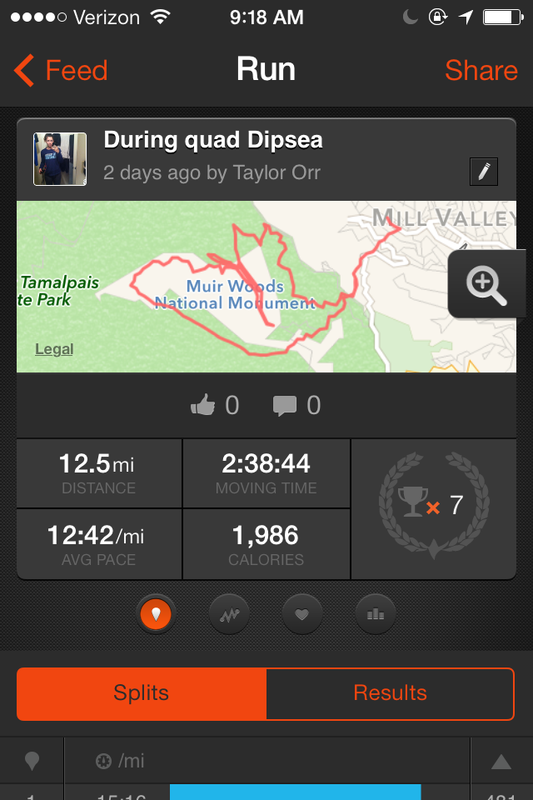 I took the Dipsea about 3.5 miles back to where I started. Very hungry and happy to be back at the car containing my coffee shop protein bar snack, I had learned a valuable lesson: always bring fuel, especially when you venture onto the trails by yourself. I also climbed almost 3,500 feet. Next time, I’m bringing chomps or gu.